What’s the first thing you do to try and soothe a crying baby? You stand up and rock them. Turns out this natural calming technique goes way back and there’s a good reason for it – it works! According to a study published in Current Biology, the act of standing up to calm babies is very instinctual and has been proven around the world for centuries. However, researchers wanted to delve a bit deeper into the science behind it. 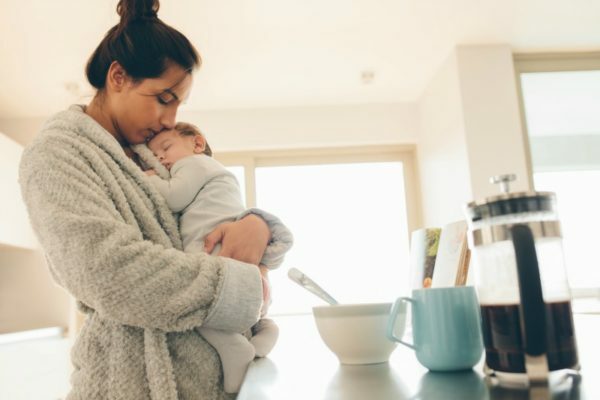 “Infants under six months of age carried by a walking mother immediately stopped voluntary movement and crying and exhibited a rapid heart rate decrease, compared with holding by a sitting mother,” say the authors of the 2013 study. Okay, nothing too groundbreaking here of course, but what is interesting is that the action of the mother standing and the baby subsequently calming has been observed in other mammals too. The researchers used pharmacologic and genetic interventions with mice and found the results very similar to humans. “We identified strikingly similar responses in mouse pups as defined by immobility and diminished ultrasonic vocalisations and heart rate,” say the authors. Essentially what the study proved is that even though motherhood may be difficult at times, ultimately our bodies already know what to do and our babies are in sync with us. “The infant calming response to maternal carrying is a coordinated set of central, motor, and cardiac regulations and is a conserved component of mammalian mother-infant interactions,” the researchers concluded. So next time you’re having a particularly bad day, or your bub just won’t settle, remember you already know what to do. While excessive crying can be really trying (especially in a bub who is fed and appears well otherwise), don’t overthink it. Just pick them up and get moving! You were born to do this and there’s nothing like a mother’s touch – when you’re not sitting that is! Do you use your mother’s instinct when it comes to your baby? Share your experiences with us on our Facebook page.